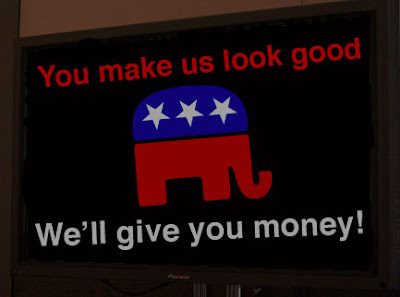 In the face of falling ad revenue and declining subscribers, the Republican Party secretly met with Chicago area publishers to pitch a bailout plan. The plan would provide billions in grants to newspapers. As explained by Donald Plimsoul, a representative for Newt Gingrich, the Republican Party just wants to help defend an American Institution. "Newspapers have long been a part of our American tradition." He said. "We cannot have the government this country deserves without newspapers." Plimsoul noted that the "Democrat Party" opposes the Free Restored Engaged and Energized Press Act, or FREEP Act for short. "They are giving ACORN 1 trillion dollars, but they won't give you a penny. I have to wonder if they support a free press?" In order to get needed funds to the media, Plimsoul says that the Republican Party must gain a veto-proof majority in Congress. To do that, they'll need the media's help. He said the media could help by not diluting the Republicans' "balanced messages." "Our talking points are a careful balance of information, populist outrage, pride in our common pre-socialist European heritage, and faith in higher powers. When you try to add Democrat viewpoints to our message, you upset the balance, and dilute the message." He then displayed the controversial New York Post cartoon. "We appreciate the effort, but the message is unbalanced. Instead of making those of non-European origin regret stealing the election for Obama, it gave them an excuse to unite against 'racism.'" Plimsoul suggested that newspaper hire Republican advisors to insure that all stories are properly balanced. He added that over Fifty percent of guests on the Sunday talk shows are conservative, and if the newspaper industry wants to survive, they need to exceed that number. "The newspaper industry is on the verge of collapse. Papers are being forced to lay off their advertising representatives. Some are even saying that the Internet will replace the newspaper. You don't want that, do you? The American people need to hear pro-American messages. We don't have time to listen to Democrat messages anymore. You need to either work with us, or go out of business." Even the alternative media is getting on board, said Plimsoul. "It's hard for them to give up their Democrat support. But they are getting rid of their cartoonists, like Tom Tomorrow. This saves them a few dollars in the short run. It also buries their socialist propaganda in a wall of text that no one will have time to read. We'll look favorably on this when they send in their bailout applications." Plimsoul also said that there would be no restrictions on how newspapers could spend their money. The publishers could spend all their money on "bonuses" if they wanted to. "Who's going to report it to the public? Media Matters?" Everyone in the room laughed. When asked if this plan would drive up the deficit, Plimsoul corrected the publisher. "That is old fashioned thinking. We need to start thinking in terms of good spending and bad spending. The money we spent on rebuilding Iraq was good because it created a Middle Eastern nation that is dependent on us. The money Obama wants to spend on schools and roads will make the American people dependent on the government." After the presentation, a representative for the Tribune said they would consider the offer. "Well we've always been friendly to the Republican Party, and we're always open to giving more space to Rick Santelli. If this works out, we can get a check in 2013 for our century of support for the Republican Party." Chris Olson, publisher of The Bolingbrook Babbler, wasn't convinced. "I'm convinced that the newspaper industry will collapse before 2012. The Republican Party is just trying to buy as much good press as possible. By 2013, there will be very few newspapers left, so they won't have to spend that much on a bailout. It's a good deal for them." Olson also added, "I fully suspect that The Babbler will be the only paper left in the Chicago area, and we won't need the Republican's funds. Though they are welcome to keep reading Ticked Off Ted's column." No one from the National GOP office claimed to know about the deal, or about Donald Plimsoul. When this reporter called Gingrich's office, the receptionist said, "Newt! This reporter has a great idea!"